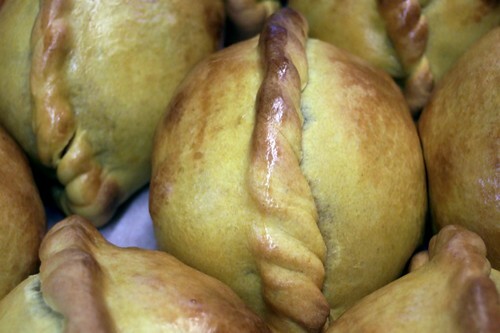 Photo: Salteñas from Don Arturo, a Bolivian restaurant in Arlington. We closed on our very first house. Falstaff the mortgage broker will lend us a penny, indeed quite a few pennies, and we shan’t retort the sum in equipage. The key to our little salteña of a house was handed to me quite casually as we signed papers that committed us to debt. A key in exchange for—I can’t write it. As Carlos keeps repeating cheerfully to vex me, “Wow, we owe more than half a million dollars!” It’s just wrong, but it feels so right. There were a moments of elation as we entered the house for the first time using the our key. The our fridge hummed and made ice. The wood floors glistened and asked for our rugs. The walls wondered about our art. The rooms no longer seemed empty, now they buzzed with the phantoms of our belongings. We toasted ourselves at the bar around the corner and returned to the house to slap three paint samples on the master bedroom wall. Our first house! Yippee! In our giddiness, I had forgotten the List. The list of things to do, fixes needed to make the house ours, to correct imperfections, to honor the house’s history. Friends tell us our list of fixes will change when we move into the house. Things that we are sure must be changed immediately will become livable as other priorities intrude. Exhibit 1: the guest bathroom. 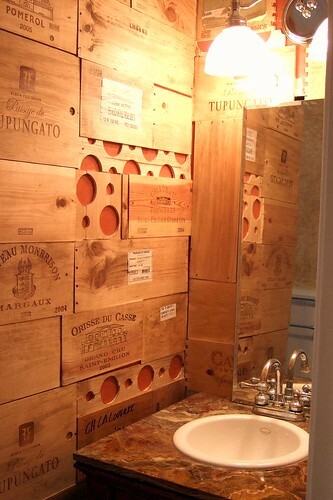 Photo: Guest bath decorated with wine crates and corks. It’s on the list, but I can live with it. So, first painting the bedroom, then receiving the household goods, then fixing the air conditioning/heat pump system, then deciding what to do about the fish in the little pond (seriously). Well, maybe we can just keep feeding the fish. The house is our little salteña to fill as we choose. Congrats! おめでとうございます！How about toilette slippers? Madam says: I miss my Japanese tub!